Handel composed Samson directly after completing the Messiah. After its premiere in 1743 in the Covent Garden Theatre in London, the work rapidly became one of the composer’s most successful oratorios alongside Esther and Judas Maccabaeus. This probably had as much to do with the popular Old Testament story of the libretto as with Handel’s masterly shaping of the arias and choruses. By including some movements in the appendix, this edition makes it possible for the first time to perform the work in its original 1741 version. 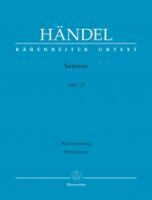 The edition is based on the complete edition volume of the Halle Handel Edition (BA 4099), offering the complete music text of the oratorio for the first time.